The Vice President, Shri M. Venkaiah Naidu addressing the East West Cultural Festival organised by ISKCON, in New Delhi on November 12, 2017. New Delhi: The Vice President of India, Shri M. Venkaiah Naidu has said that education is a key instrument in developing social infrastructure – for it breaks the vicious cycle of poverty and underdevelopment. He was addressing the East West Cultural Festival in commemoration of the 121st birth anniversary of Srila Bhaktivedanta Swami Prabhupada, Founder and Acharya of ISKCON, here today. 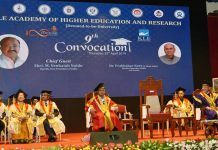 The Vice President said that for millenniums, India has served as the seat of knowledge, combined with its deep and rich culture, it has taught countless people the righteous path of life. He further said that India has also been the land of Maha-purushas who dedicated their lives to serve humanity. The Vice President said that due to globalization and technology, the world has become interconnected and multi-culturalism is common. He further said that much before all of these began, Swami Prabhupada had already built a bridge between the East and the West and that bridge was a cultural bridge. It allowed the west to experience the rich heritage of India, he added. The Vice President said that we meet at a very peculiar time where on one hand the world is making rapid advancement in various fields; yet on the other hand many challenges in the form of terrorism, environmental degradation, drug addiction, hatred, hunger & poverty continue to stare at us. He further said that culture, on the other hand, is the life-sustaining force of social infrastructure. It enlivens ethical and moral values that seem to be eroding in our modern lives, he added. “In many ways it is astonishing that a person who is seventy years old did all of this, sleeping just three-four hours a day and produced so many books which have been translated into 82 world languages. But, we meet at a very peculiar time where on one hand the world is making rapid advancement in various fields; yet on the other hand many challenges in the form of terrorism, environmental degradation, drug addiction, hatred, hunger & poverty continue to stare at us. It is in challenging times like these that I find the message of Swami Prabhupada very relevant. The beauty of his teachings lay in the fact that he united everyone under the banner of devotion and service without making any distinctions of race, gender, caste, religion or social status. He and his movement are equally accessible to anyone and everyone. This is the teaching of this land that we see everyone as one family without any bias or distinction – Vasudhaiva Kutumbakam. It is natural that when we see the world as one family, our care and concern extends to everyone. This was witnessed in the life of Swami Prabhupada. He not only provided spiritual teachings but equally cared for the wellbeing of others. I’m happy to learn that the project he started as the Hare Krishna Food For Life is today the world’s largest food relief program. Under the Annamrita program, ISKCON members daily feed 12 lakh government school students free meals. Under the tribal care initiative the organization is providing education, health care in remote parts of Assam, Tripura, Jharkhand, Odisha and West Bengal. All these initiatives are highly commendable. Education is a key instrument in developing social infrastructure – for it breaks the vicious cycle of poverty and underdevelopment. Culture, on the other hand, is the life-sustaining force of social infrastructure. It enlivens ethical and moral values that seem to be eroding in our modern lives. But to me – Swamy Prabhupada’s greatest achievement was that he was an exemplary ambassador of India’s ancient civilization. He carried the same traditional values that you, his followers, are now promoting from inside and outside the shores of India. And he was so remarkably successful in doing this, that today we see hundreds of thousands of westerners who are exceptionally Indian in their outlook and remarkably Vedic in their lifestyles. 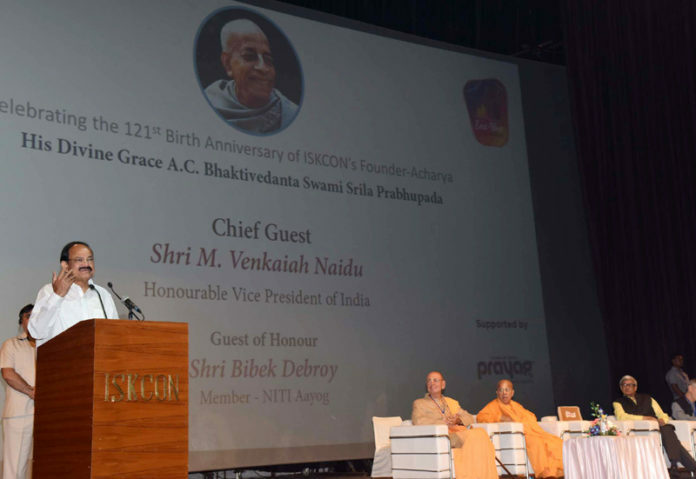 Movements like ISKCON, which celebrated its 50th anniversary last year, are helping the youth of India who are our future to lead a compassionate, service oriented life free of vices. The 15th century saint Sri Chaitanya Mahaprabhu enjoins all Indians to do paropakara or welfare activity for humankind. This is what our scriptures have also said – “Paropakaararthamidam Shariram” (This body of ours becomes useful if it serves others). This is a direct order that Swami Prabhupada, who comes in the lineage of Sri Chaitanya Mahaprabhu, took to heart when he travelled worldwide and promoted the true glory of India. He spread Krishna consciousness around the globe. It is a consciousness which promotes love, harmony and enables each human being to realize the divine forces lying latent within us. Once again, I thank you for inviting me to be here amidst all of you for this nice festival. I wish you all success in your future endeavors to serve the society.